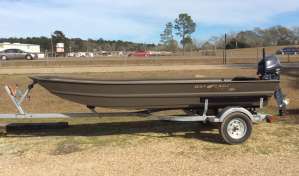 Big Wheel Boats, located in Hammond, Louisiana, is the authorized dealer for Blackjack, Frontier, Bass Cat, , and War Eagle Boats. We stock a full line of Yamaha, Suzuki, and Evinrude outboard motors. We have an extensive inventory of marine parts and boating accessories. We encourage you to bring your boat in with confidence for boat motor repairs. Our certified technicians and parts manager have over 60 years experience in outboard parts and service. We service all brands of motors. CALL NICK TODAY AT 985-345-3252 !!!!! NEW WAR EAGLE 754LDV\r\n\r\nOD GREEN\r\n\r\nTREAD PLATE FLOORING !! !\r\n\r\nEVINRUDE 30HP!!! MOTOR COMES WITH 10 YEAR WARRANTY UNTIL MARCH 31ST, 2018\r\n\r\nMAGIC TILT TRAILER 13\' RIMS !! !\r\n\r\nHUNTING A GREAT DEAL? $$$ CALL NICK AT 985-345-3252 !!!!!! 21\' Palm Beach\r\n\r\n150hp Suzuki 2013 4 stroke Clean !!! !\r\n\r\nNO WOOD Construction\r\n\r\nGalvanized Trailer\r\n\r\nCall Nick at Big Wheel Boats 985-345-3252\r\n\r\n$12999.00\r\n\r\nReady to Fish !!! THESE ARE BRAND NEW ENGINES in the BOX \r\n\r\nPOPULAR BRANDS OF ENGINES overstocked on engines\r\n\r\nCALL NICK NOW FOR DETAILS and $$$ SAVE $$$$***\r\n\r\n985-345-3252***\r\n\r\nSpecial Pricing NOW!!!!!! *** *** **HURRY NOW !! !\r\n\r\nHuge Selection in Motor Sizes and Shaft Lengths, prices start at 900.00 and up\r\n\r\nNO Shipping available\r\n\r\nCALL BIG WHEEL BOATS in Hammond, La. 754FLD WAR EAGLE OD GREEN\r\n\r\n40HP EVINRUDE MOTOR \r\n\r\nMAGIC TILT TRAILER \r\n\r\nPLEASE CALL NICK @ 985-345-3252 !!!! \r\n\r\nSTOCK# WE-43 HURRY !!! NEW 2017 WAR EAGLE 648 LDV\r\n\r\nADVANTAGE MAX 4 CAMO \r\n\r\nTREAD PLATE FLOOR\r\n\r\n25HP EVINRUDE !! !\r\n\r\nMAGIC TILT TRAILER WITH 13\' RIMS !! !\r\n\r\nCALL NICK AT 985-345-3252 !!! HURRY!! !